After a couple of days, we leave our Bulgarian chill area and start our journey to Turkey. Bevor crossing the border we just must stop to fill our gas tank since Bulgarian petrol is about 0,30€ cheaper. Crossing the border in Malko Tarnovo is easy and after about 45 minutes we enter a new country on our list. Initially we planned to cross Turkey in only 3-4 days, but after reading up on all the sites along the black sea coast we decided to spend at least a week here. Although we did not plan to stop in Istanbul we had to do so involuntarily due to a huge traffic jam on the highway passing by the city and reach our desired camp site in Istanbul Kamp only by night. However, we find the place totally deserted and are not sure whether it is closed due to low season or completely abandoned. With the help of some locals we manage to find a new camp nearby and can spend the night directly at the beach. After a short night and completely soaked as it was raining the whole night we set off towards Amasra and hope for better luck this time. As we reach the city we stop by in a small café (Marina) and casually ask if there are any recommended places to spend the night. The owner family happen to have a small guest house with a few rooms and we manage to get one for only 15€ per night. 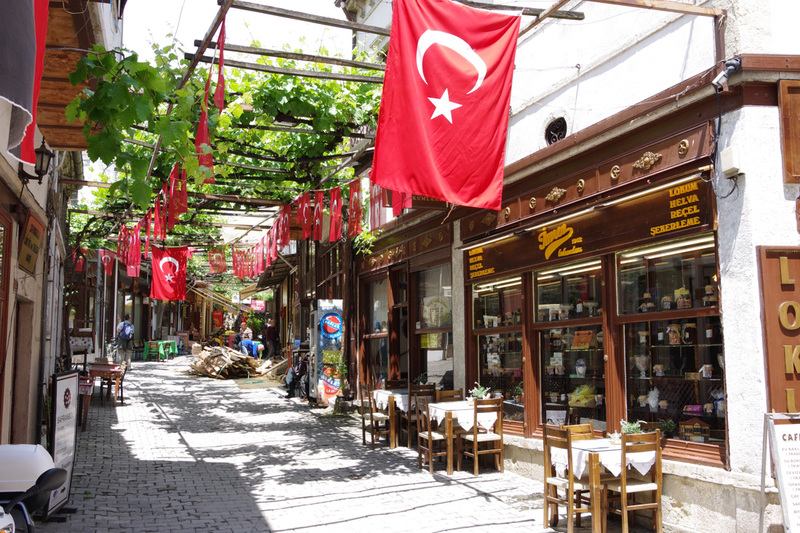 The next day we leave Amasra and head to Safranbolu a former place where the caravans could rest on their way through the silk road. With sunny weather, we explore this beautiful and charming city and wander around its small streets, visit the mosque and have a cup of strong Turkish tea. It is the month of Ramadan so the Muslims are fasting, which means you do not see anyone eating or drinking during the day. Five times per day people head to the mosque to pray. Besides that, not much seems to happen during the day. However, at 8pm all restaurants and cafés are crowded with people and families who meet to have their first meal during the day. The have one hour to fill their stomach after that it’s fasting time again. The times for the namaz (praying) is displayed on digital boards in the mosques. People spend much of their free time playing games and smoking shisha in the cafes. This seems to be a standard package in most of them. In the meantime we discover baklava (although we have a lot of it in Berlin as well) and eat just too many of it every day.. The Turkish black sea coast is really amazing. We are travelling in low-season times which means we do not see many people around and can enjoy most of the views for ourselves. We also are addicted to Turkish bread (Ekmek). Especially the pide are delicious during the Ramadan. It’s a delicious low budget food and you can find fresh pide almost everywhere. Just watch out for a pile of wood besides a shop. This means they have an oven and make the bread by themselves. Driving a car in Tukey is easy. The style is not really aggressive and drivers stick to the rules, the roads are good. If you are taking the highways between Edirne and around Istanbul do not forget to pay the toll. You have to buy a sticker in advance at a gas station and load it with some credit. It costs around 10€ and the amount will be debited as you drive through the payment gates along the road. We spent a couple of nights in Camp Marti close to Sinop and can truly recommend this place. The campsite is directly at the water is very spacious and tidy. The owners are a Turkish Ukrainian couple and took very good care of us. They serve us some delicious food and told stories from their life. Archan the owner has met Natalya 17 years ago in Crimea. They fell in love and she followed him to Turkey. Today he speaks some Russian and she speaks some Turkish. Together they created a secret mixed language that only they understand. Usually they have a lot of bookings but so far we are alone there -yeah! After two days, we say goodbye to each other and head further along the coast towards Trabzon. There are not many campsites on the road anymore and it is difficult to find a nice place to stay like for example in Unye (directly at the beach). Bathroom facilities are not worth mentioning anymore. We heard a lot of good stuff about Trabzon which we can confirm. It is a nice small oriental city with narrow streets filled with small shops. After trying to bargain with some of the hotels we find ourselves a kind of a good deal and spend the night in the Ts Park Hotel directly at the main square. The room is not great, but we are right in the middle of everything and can watch the locals as they gather for their daily meal at 8pm and play board games and chat in the cafes afterwards. Besides the classical souvenirs you can print your photo on a carpet here. You can recognize a lot of minivans which transports people on the slogan „Allah Korusun“ which means Allah will protect us. Some traffic lights are fitted with extra LEDs so that you can see them from far away. Unfortunately, the famous Sumela monastery is closed so that we can only get a view from a distance on it. We still pay the 5€ fee to enter the park and spend some time in the mountains surrounding the monastery. Rize is the last city before the Georgian border. We spend one day here, say goodbye to the Turkish dogs which really liked us and sleep in the worst hotel of our lives (Hotel Tibet). At least we can climb to the roof of the hotel to make some pictures. As we were travelling through Turkey our initial fascination has faded a little bit. The people were friendly, the coastline was beautiful. Many people have worked in former West Germany and have warm feelings for Germans. However, as we travelled eastwards the infrastructure got worse and we felt like overpaying for things a lot of times. We bargained well but still could not lose the feeling that we still did not make a good deal. Anyways we will definitely come back to see the rest of this huge country. Now it is time to enter Georgia – a place we were looking forward to since the beginning of our journey.